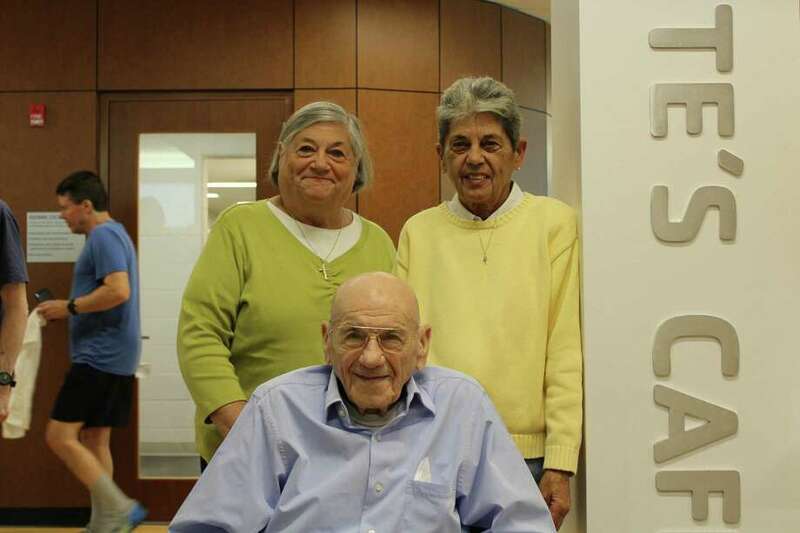 Dante Chicatell with daughters Sandra and Patricia at the New Canaan YMCA on Friday, November 10 2017 in New Canaan, CT.
NEW CANAAN — Several people lined up inside the newly-inaugurated Dante’s Café at the New Canaan YMCA to congratulate the morning’s honoree - soon to be 104-year-old Dante Chicatell — and to get a firsthand view of the new cafe located on the first floor. About a dozen people waited their turn to shake Chicatell’s hands, offer words of praise and wishes for his upcoming triple-digit birthday Nov. 24. “I came this morning just for you,” a man told the bespectacled Dante as they shook hands vigorously. “You’re my inspiration,” remarked another. Chicatell worked for Stamford-based, technology company Pitney Bowes during World War II where he was involved in the construction of little computers for bomb sites. He joined the New Canaan YMCA back in 2000 and remains a greeter working two days a week. Regardless of his advanced age, Dante’s spirits remain as high as ever. “Peace, love and harmony,” Dante said as he posed for pictures with several of the celebration’s attendees. He personally thanked those who had come to the event with the same smile with which he greets any person that comes through the YMCA doors. Sandra and Patricia Chicatell, Dante’s daughters, stood alongside him throughout the celebration. “I think it’s an amazing tribute that the patrons and the staff voted for his name to be on the cafe,” Sandra said. “Our father was born and raised in Stamford. He was a great dad, a great comforter growing up,” Patricia added. “We’re a family at the Y and we’re so lucky to have Dante as part of that family,” Barrett said.